12/29/14 - Just a brief advisory regarding our web site outage in the last few hours. There was no explanation for our site and many others being down for a period of several hours, but all seems to be back to normal for the moment. Over the course of the next 2-3 days, the Kohs & Company web site will be moving to a new home on a dedicated server, our E-mail service will be moving as well. Hopefully this transition will be made with no further outages or problems, but there are no guarantees unfortunately. The change is being made to provide a more secure web home and E-mail services especially for our international suppliers and customers. I'll provide further updates once the move is complete. Thank you in advance for your patience if you experience problems in viewing this site. 12/24/14 - Merry Christmas to all visitors to our Kohs & Company web home. Wishing that the spirit of the day becomes a guide for the future. 12/12/14 - I previously mentioned meeting Lee Marsh, owner of Lee Marsh Model Company in Scotland while at the show in Germany and I now have an exciting update. Lee has decided to accept an invitation to attend the O Scale March Meet in Chicago and he will be displaying some of his models in the Kohs & Company display. I anticipate hosting an informal gathering of our customers, as I have done in the past, so that Lee will have a chance to meet some of my owners and discuss his models in a more comfortable setting. There will be more information available as we get closer to the March Meet. I guarantee that those that take the opportunity will have a great time talking models with Lee. 12/10/14 - There is a great happening currently as we head into the holiday season, all of our projects are making great progress thankfully. New updates are coming for all three of our locomotive projects as the enthusiasm and anxiety regarding the Big Boy continues to build. The project updates will be posted by the end of this week. We are again experiencing IT difficulties with our E-mail service, primarily affecting overseas correspondence. As a result, change is in progress and hopefully if all goes well you won't even notice that changes are happening. A new server is being put up and dedicated addressing will be in place for our web site as well as all E-mail communication, so it will not only be more reliable, it will be more secure. The demand on our online resources has reached new levels with more than 30,000 visitors to the web site last month and more than that already tracking for this month. Seems our current provider is struggling to deal with it all. The web site will be undergoing software changes as well, so if you notice the occasional glitch, know that chances are we are already aware of the problem and are working on it. If the problem persists, please by all means let me know. 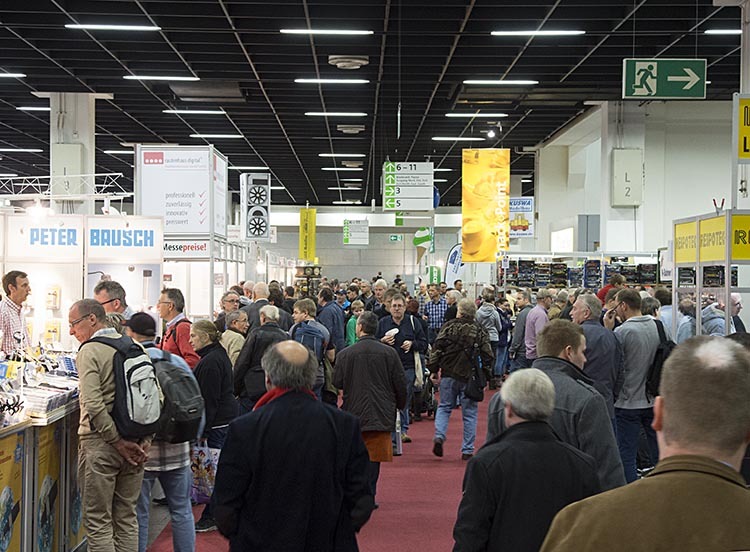 12/02/14 - One final mention of the show in Germany, I have just received the final press release from the show and it you are interested, you can read it by clicking HERE. Needless to say, I was surprised and very pleased by the special mention of Kohs & Company in the release. The Lego show, which was fantastic (I love Legos), was held in a separate hall in the massive venue. It had it's own promotion and was I believe a huge draw for kids, another clue for show promoters here in the states. The bottom line evaluation for the success of the Kohs & Company display says that there were two main factors that drew visitors to the display. First of all the UP Challenger models that were on display, the promoters had requested numerous photos of the models prior to the show and used them to promote the show itself. Many people visited specifically to view the Challengers. Those already aware of Kohs & Company came to learn more about the Big Boy, Class A and Cab-Forward projects. Having the newly completed flat car production samples on display was a special treat once visitors were in the booth. Again, many thanks to everyone that made the effort and in many cases, a special trip to the show to see and talk about our latest efforts. Kohs & Company owners came from Austria, Belgium, France, Germany, Italy, Switzerland, The Netherlands and the United Kingdom to visit, apologies if I missed anyone! 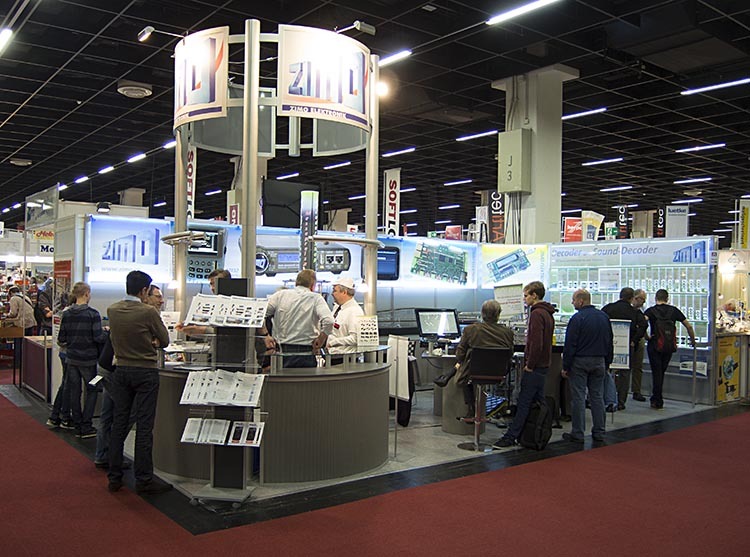 12/01/14 - I failed to include a couple of images of the new Zimo Electronics control equipment in use at the show in Germany. I thought that maybe if I included the images, I could actually get some of the equipment for myself and customers! Actually there is news on that front and I'll report in a soon to come update. If you're interested, scroll down a few images and you'll see the latest and greatest from Zimo. 11/27/14 - First of all, to all visitors in the states, Happy Thanksgiving! Wishing you peace, friendship and family togetherness on one of most peoples favorite holidays. A day of eating!! As mentioned in the last brief update, while at the show in Cologne, Germany I captured a few images from the show that will relate the flavor of the event. Shown immediately below is the Kohs & Company booth, including a few of the many visitors that came by to say hello. 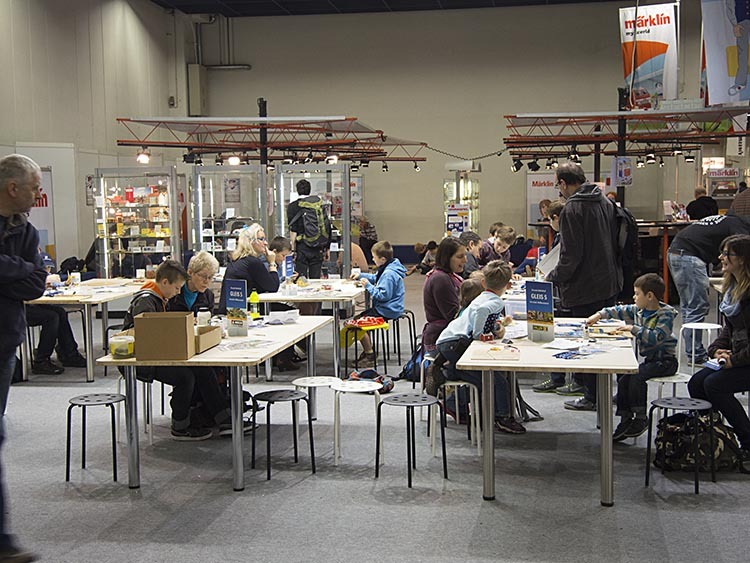 Every booth is required to have it's own walls unless the display area is so large it can be an open area, ala Marklin and LGB. The last running of this event logged more than 65,000 visitors in four days, this year the numbers I heard were closer to 80,000, but I'm waiting to hear the official totals. This view of the crowd was pretty typical from the time the show opened and until the very end. There was never much of a let up, the people just kept coming! 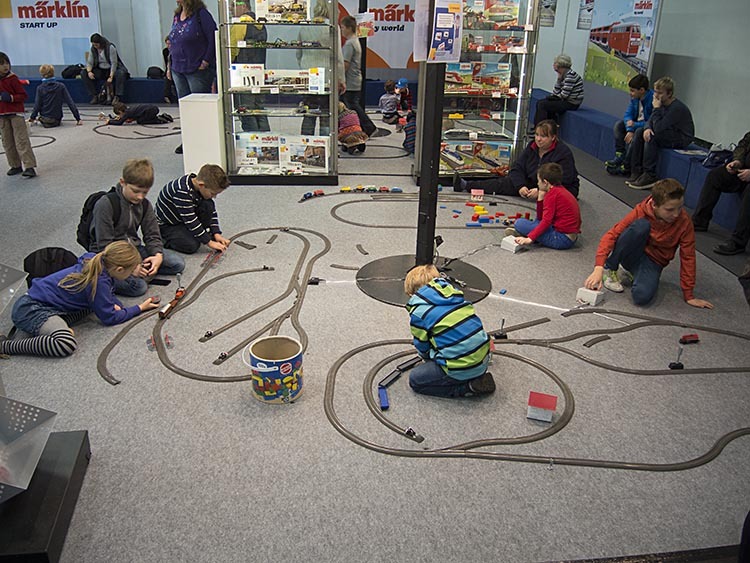 One of the most impressive aspects of the show was the effort that the organizers and exhibitors alike made to get the kids involved with trains and railroading subjects. The next three images show some of the activities that were provided to get the kids involved. The children had access to multiple scales and products ranging from snap together trains to large-scale products that they could setup and play with for as long as they liked. There were also drawing activities and building construction where the children could take home their finished projects. All the supplies were provided at no cost to the families involved. When was the last time you saw this type of promotion of the hobby? The kids area was constantly busy from the opening of the show until closing every day and there was genuine excitement amount the kids taking part. There were dozens of layouts, large and small, from manufacturers as well as clubs from around Europe and the United Kingdom. The layouts ranged from those featuring detail and trackage packed into every corner to expansive scenic landscapes and everything in between, all beautifully executed. 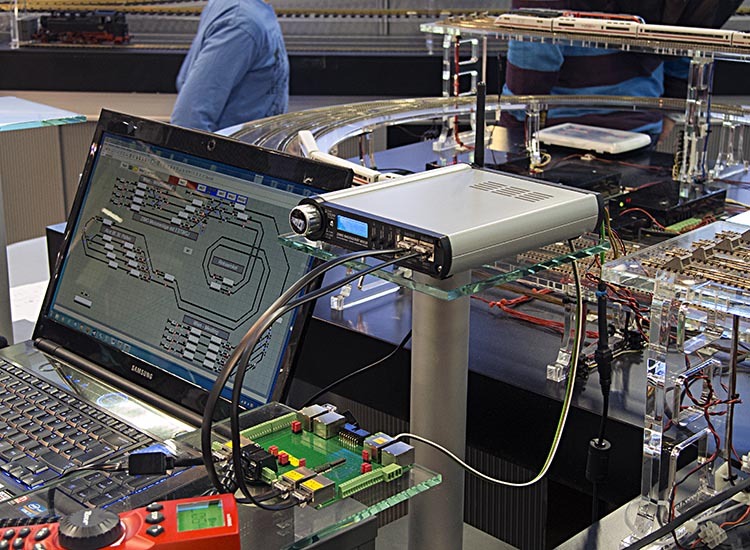 The most common product category had to be electronics, primarily DCC components and supplemental equipment that expanded the capabilities of basic DCC technology. The booth shown below is that of Zimo from Austria. I had conversations with Peter Ziegler the Managing Director of the company about their new products and their future availability, I'll be sharing more information about that in coming updates. The Zimo display had a highly automated layout using automated routing and proximity sensors for multiple train control. 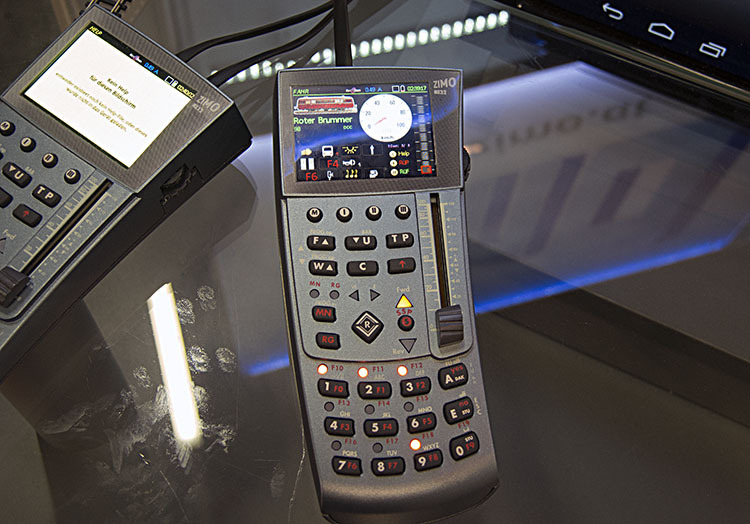 The device front and center in the photo is the highly anticipated MX10 command station which provides the power and control interface, including radio, for the new hand controllers. This images shows the new MX32 hand controller. This is the other half of the equipment that I have been hyping with customers for use with their Union Pacific Challenger models from Kohs & Company. If you're interested in learning more, click HERE for the parent company web site or if you are located in North America, click HERE for the North American distributor web site. One of the favorite manufacturer displays is always KM-1, the large scale importer who's booth always features lots of smoke and action. An added feature of this years event was on the second floor of this very large facility, the show was housed in building #4 which was part of a convention complex featuring more than a dozen venues. You can see below a great deal of track layed out for live steam operations. Free rides were provided throughout the run of the show and the live steam organizations came from all over Europe and even the U.K. to take part. There was a very limited amount of time for me to leave the booth to take pictures and meet with other exhibitors since there was always a stream of visitors at the Kohs & Company booth, but I think you can gain a bit of insight regarding the quality and expansiveness of the show. If you ever have an opportunity to visit one of the large European shows, I encourage you to take it. The only event in the states that is even similar is the NMRA National Train Show, which pales in comparison. 11/25/14 - The show in Germany is over and I survived the tens of thousands of people that visited the show. Before the close of the event, I took a number of photos showing the highlights of the show and quality of the displays which were a far cry from what we typically experience at the shows here in the states. Not one table with piles of moldy boxes and the efforts to get the children involved with the hobby were extensive. I'll be posting some of the photos in the next day or so, along with some narrative about new products experienced while in attendance. Many thanks again to all that made the effort to visit the Kohs & Company booth!! 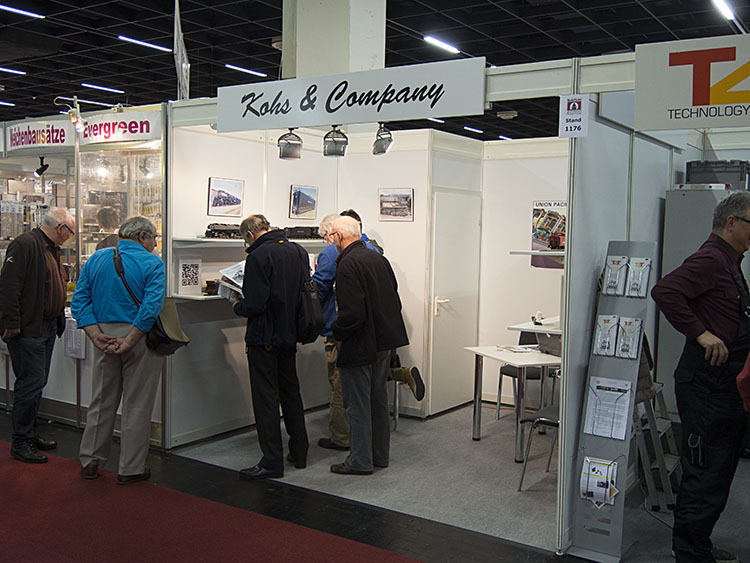 11/22/14 - There is one day to go at the 2014 Modellbahn show in Koeln, Germany and although it has been an extremely busy time filled with hard work, it has been another fantastic experience related to model railroading. It has been far too long since I have participated in a show in Europe, but based on this return experience, there will be many more visits in the future. I'll provide a full recap once the show is over and I have returned home, but I wanted to take this opportunity to thank all of my old and reliable client/friends that have made the effort to visit the show to say hello. Also to say thank you to all of my new friends made during this show. It has also been a great opportunity to have my new builder here and I thank him for the effort in attending the show and delivering the new flat car samples that you can view on the project update page. More about him in future updates. A person that I would like to consider among my new friends is Lee Marsh, who produces and imports British profile models under the company name Lee Marsh Model Company, which is located in Edinburgh, Scotland. I have been aware of Lee's efforts for several years, first as a custom builder and now as an importer of fine models. Having had the opportunity to spend a number of hours with Lee while at the Modellbahn show, I've learned just how serious he is about his labors-of-love and that he is as 'good crazy' as I am when it comes to researching and developing his projects, I encourage you to visit his web site. I have encouraged Lee to attend the Chicago March Meet show in the new year so that as many stateside modelers as possible can experience his models first-hand. I will advise in the coming weeks if Lee is able to attend. 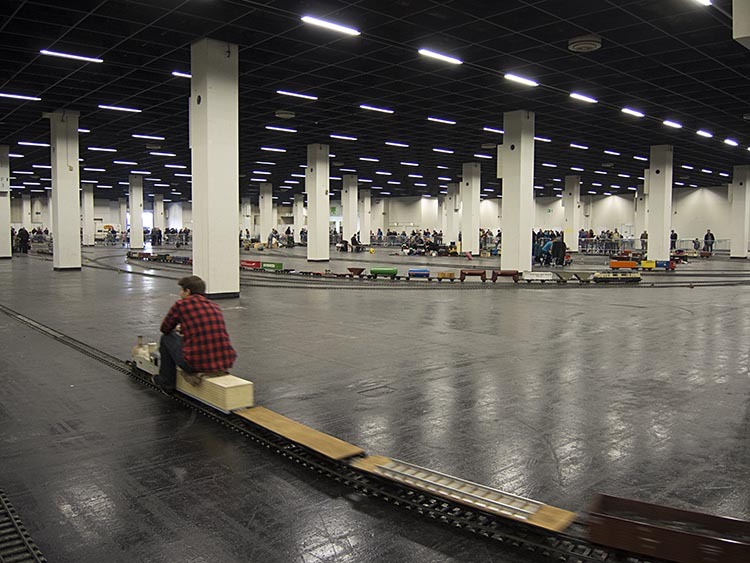 Time to head out for the last day of Modellbahn 2014, so more updates very soon! 10/14/14 - I am very sad to have to report the passing of Mr. Se Yong Lee who was the Executive Managing Director of Samhongsa Company, Ltd, which was arguably the largest producer of brass model trains ever. He managed the company during their 'heyday' when many of the models that are most prized by their owners were produced. Mr. Lee was present at many shows in the states and I always enjoyed speaking with him there and while in Korea. We never worked together due to creative differences, but I had great respect for what was accomplished under his guidance. Mr. Lee retired from the company when the train operations were sadly ended several years ago and he ultimately lost his battle with cancer last month. 9/17/14 - I have received a couple of inquiries regarding my participation in the O scale show scheduled in Indianapolis very soon. For the benefit of those who may be expecting me to be in attendance as usual based on many previous years, I will not be attending the show this year. My time and resources at this point need to be invested in mutually beneficial opportunities, unfortunately for multiple reasons, that is no longer the potential when considering the Indy show. On a more exciting note, I have had a number of requests for information about the show in Cologne, Germany that I will be displaying at in November. 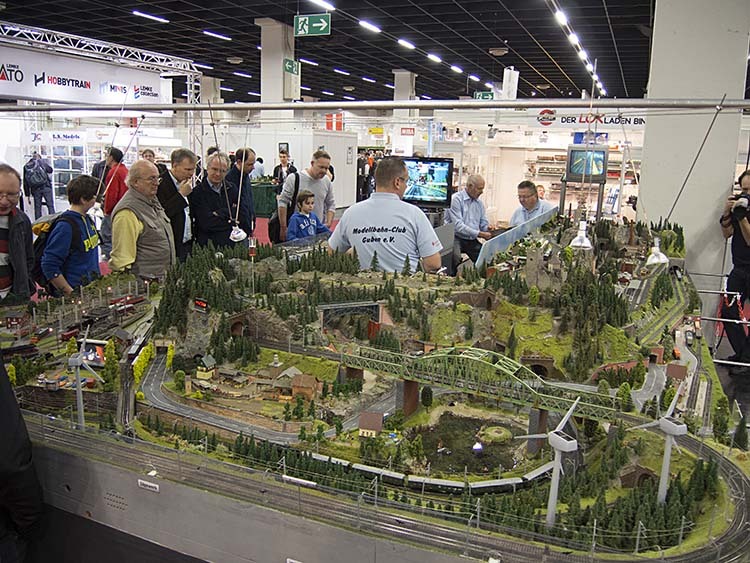 If you have interest in attending what promises to be a very exciting show, the largest model train show in Europe, I would be happy to provide information that will help in planning your trip. 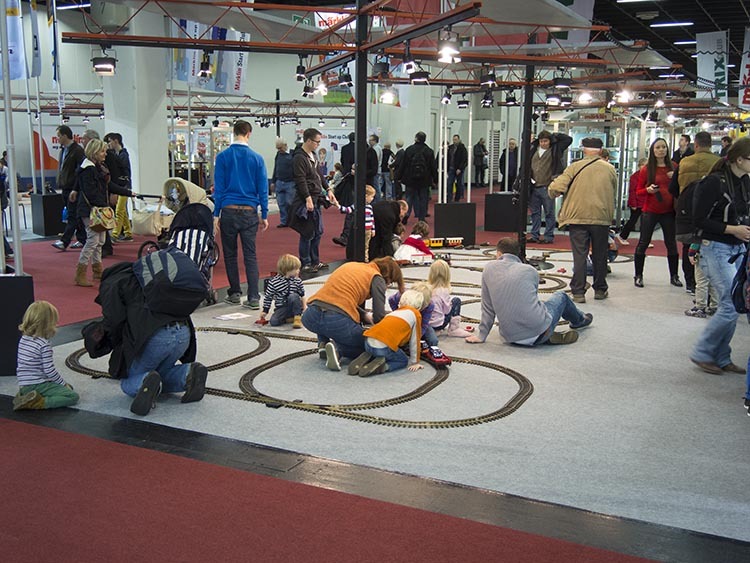 In addition, one of the largest live steam meetings to be held in Europe will take place at the same venue during the train show. For more information, click on the image below. 9/03/14 - Just a brief update for tonight; I was scheduled to attend and display that the National Narrow Gauge Convention in Overland Park, Kansas, unfortunately a late return from a trip to Asia has made that impractical. Apologies to all that I had planned on meeting with, but our production efforts at this point are taking priority over all other activities. I will be updating regarding the latest project news overseas just as soon as I catch my breath! 7/14/14 - For reasons mentioned in the last general update, the Union Pacific Big Boy project will now be the next locomotive project that I will deliver. Also playing into this change were some unique opportunities recently presented that also rely on this timing. The development of the Norfolk & Western class A will continue in parallel with the Big Boy project so that the delivery time between projects will be minimized without piling the projects on our owners that look to support each of our projects. More details regarding this change are provided in the individual project updates for these two projects. 6/27/14 - During numerous visits to Korea in recent months, I have had ongoing discussions regarding my future plans and our mutual concerns regarding the state of the brass model business in Korea, much of this information has been shared on this site. The economic realities in Korea we face going forward, the ever increasing complexity of our projects and my struggled to get to a comfortable point regarding production timing and output necessitated a careful business review in order to be viable in the future. All relevant factors had to be considered in plotting a course that was good for Kohs & Company as well as my builders, not just for the next project, but for the foreseeable future. If the price of my models was of no concern, it would be a simple matter of just raising the model prices to a point that worked for my company and the builders. Obviously, pricing is of critical importance to the more than one thousand supporters that have made 'our' projects possible and that will hopefully continue to do so in the future. I believe that while my prices have never been inexpensive, they have always represented a true value based on the models that I have delivered, especially when the resale value is taken into account. No other brass imports routinely appreciate like Kohs & Company models and while they are not typically sold as good investments, they have proven to be so. Compared to model pricing overseas, Kohs & Company models are a bargain! Long story short, to keep pricing at a realistic point, to reduce the delivery time and to allow us to undertake more projects to reduce the backlog of desirable projects, changes had to be made. The biggest change will be in our production scheduling and the changes will be noted in due course on the project site index. Our next locomotive project will be delivered in approximately twelve months and this will be accomplished without compromise as a result of efficient planning and a further investment in advanced technology. As we push to finish up our PRR cabin car and flat car projects, we are already implementing our new strategy and are very excited about the future and the new projects to come. As I have always done, the details of our efforts will be shared and explained in great detail within our web home in the coming months. Be sure to check the project site index for new updates and further details in the coming days. 6/12/14 - As promised, I have started adding some detail photos from the Challenger production models. There will be more added as time allows, but you can see the first of them HERE. 5/23/14 - As mentioned in the previous update, another visit to Korea was very recently completed. With 1.4 million flying miles logged between Detroit and Incheon/Seoul Korea, the adventure of travel has certainly diminished, but the challenge presented in a business sense has only intensified over the last twenty-five years. Witnessing and experiencing first-hand the economic growth and expansion of the Korean economy has created mixed personal emotions; happy to see the Korean people as a whole rewarded for their hard work on one hand, but frightened by the economic consequences for the brass model/train industry on the other. Over the past couple of years I have commented on the concern shared with my builders about how we could handle the primary issues of labor expenses and the loss of experienced 'hands' that can not be readily replaced. We have made a serious efforts in that regard and that has helped to prolong our general situation, but the hope has also been to expand the production capabilities to allow Kohs & Company to offer more products faster to meet the demand that has developed over the last several years. As hard as we have all worked to meet our mutual goals, the ever finer specifications for our models have been working against us at the same time. The number of builders capable of producing a model at our level is less than a hand-full in number and most are producing models for the European and Japanese markets due to the increased rate of return with models in those markets selling for substantially more than those of Kohs & Company. During this last visit, along with reviewing the progress on our two rolling stock projects being redone to meet the demands established to ensure our customer's satisfaction, a great deal of time was spent reviewing the possible options and discussing the difficult decisions that must be made to allow the development of our future projects. As I implement new plans going forward, I want those interested in Kohs & Company to know that there is a plan, that it does not include substantial price increases and that you will hopefully see more products being offered and on a more timely basis. While some may question why certain offerings are being undertaken, keep in mind that I am attempting to support and preserve a production capability that is typically far beyond that of any other builder/importer and some decisions are purely business based. Although my explanation remains a bit abstract at this point, I believe it will become more clear in the coming weeks and months. One constant will remain for sure; each of our new models will be better than the last and simply put, the goal is to be the Best. One last quick note for the day, when looking at the site index page, you may notice some changes in titles and labels, the changes are pretty self-explanatory, but there is a guide for some of the new labeling at the top of the index listing. There will be more changes in the coming days, including some additions. Please check back often for the latest information! 5/13/14 - An interesting side note from a recently completed trip to Korea; during the visit, I asked several builders that I met with what they thought of the photo that is featured on our home page. They all thought that it was a nice photo, but they hadn't paid much attention to it thinking that it was a real locomotive in the photograph, including the man that built it. To a man, they had a very difficult time believing that it was one of our Challenger models in the photo. This was a real tribute to the caliber of our model and the outstanding weathering and photo work of Lee Turner. More about the trip in the very near future. 4/28/14 - Just a brief note to thank everyone that came by the display at the TCA York Spring Meet this past weekend. It's always a big crowd and a good opportunity to introduce those not already involved with O scale modeling to our segment of the hobby. It has been a busy year already with good progress being made on old projects and new projects alike. be sure to check out the latest updates on the individual project sites. The are also new photos posted to the Weathered Model pages, including the first of our Union Pacific Challengers to be weathered, a stunning piece! Time is always at a premium, but currently it is more so than ever, with show commitments, customer assistance matters and timely travel back and forth to Korea. I am trying to handle your phone calls first hand and also deal with numerous E-mails on a daily basis, so please continue to be patient. As we push forward with our new projects, I am always looking forward to your guiding comments and suggestions. 3/27/14 - It has been a few days and things have been extremely busy, but I wanted to take a few lines to publicly thank the Hill family for another great job of hosting the O Scale March Meet in Chicago. The feedback that I heard during the show and since indicates that most in attendance considered the show to be the best in quite some time and I have to agree. What a difference it makes when the show organizers put some effort into planning and follow through! The informal gathering that we arranged for Saturday evening had a nice turn out and was a great opportunity to share ideas about current and future projects, this is something that I'll continue to do at select events. It was also great to have Steven Treat and Nigel Ambler from Cameron Micro Drill Press with us at the display tables as well as during our gathering, there was never a shortage of modelers interested in discussing their products and machining techniques. Many thanks to all that took the time to stop by and say hello! 3/12/14 - The O Scale March Meet is coming up this weekend in Chicago and as usual, Kohs & Company will be there. 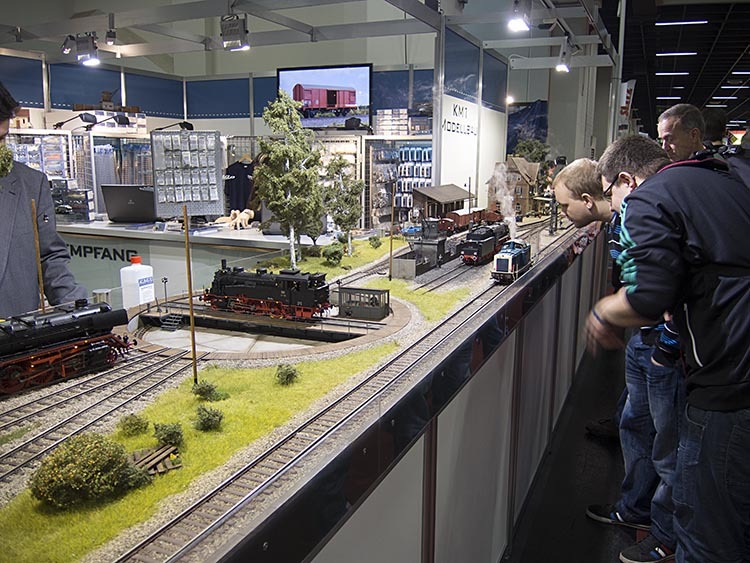 The March Meet is the last remaining show that is a 'must attend' for O scale hobbyists. At this year's meet, Steven Treat and Nigel Ambler from Cameron Micro Drill Presses will be with us to introduce their latest new micro drill press. Be sure to stop by to see the latest in American made precision technology. 2/13/14 - Just a brief update related to outgoing shipments to customers. I have been receiving ongoing weather alerts from UPS and USPS regarding delays and problems with delivery services in various parts of the country, most recently related to the East Coast in general and the North East and South East specifically. I have a number of shipments ready to go, but have held them back waiting for the weather to clear in these areas. Injecting high-value shipments into the systems has been discouraged and I have headed that advise. A day or two of delay in safety seemed the smarter choice than having our shipments bouncing around on uncertain routes. It has been an amazing winter locally here in Michigan, we are use to snow, but we have had more than seventy inches so far this season and that has created issues here as well. 2/04/14 - A weathered Pennsy K-4s has been added to the Weathered Models pages, again the work of Lee Turner is highlighted with these photos. I continue to present weathered model information in an effort to provide some ideas for what can be done with the models that Kohs & Company has produced. Weathering in general remains as a serious point of discussion, both pro and con. On the 'con' side, poorly done weathering not only looks bad, it seriously negatively impacts the value of any given model. On the 'pro' side, well done weathering adds another layer of artistry that can not only enhance the realistic appearance, but also the value of a model simply based on the reputation of the artist doing the weathering. 2/01/14 - If you have attempted to call Kohs & Company since the holiday season, more than likely, you have had a difficult time reaching me. Between travel for project development purposes and maintaining a nose-to-the-grindstone preparing and shipping models, I have been leaving most communication to E-mail. If you call and leave a message I will get back to you and I have been timely with E-mail response. Once all of the new models have been shipped communications should be back to normal. For these same reasons it is doubtful that I will make it to O Scale West again this year. Our project development and shipping efforts really need to take priority at this point. I always look forward to seeing the modelers on the west coast that I never see any other time except for O Scale West, so I do hate to miss the opportunity. On the subject of shows, I have been getting a lot of great feedback to the question that I posed in the 1/12/14 update. Many thanks to those of you that took the time to write and share your ideas. I'll share in future updates what my thinking is on the subject and what the purpose was in asking the question. I am still very much interested in hearing from anyone else that would like to offer their thoughts. Be sure to check out Lee Turner's latest work on the Weathered Model page, a Kohs & Company NYC J3a Hudson. 1/12/14 - Just a brief update with a couple of comments and a couple of questions to ponder. When I receive repetitive comments on a subject or idea, I figure it's best to present it to all that may have interest and see what the collective thought is on that idea or subject. In recent weeks there have been a number of inquiries about the status of the book proposal written about in regards to the production of our Big Boy project. At this point I can tell those interested that the concept has evolved and will now include material other than that directly related to the Big Boy production. It has been decided to present the Big Boy information within a framework of historical information related to the development of the brass model industry in South Korea. Information about key personalities and companies will be included so that a better appreciation can be reached for just how much has been achieved since South Korea became the epicenter for brass model production. With the Big Boy project as the subject, a model produced by virtually every builder multiple times, the detailed coverage of our project will highlight and help to explain the advanced techniques and technologies that we now employ compared to the many prior examples. I am already seeking the input of other Korean builders so their efforts will be given due credit and the coverage will be as factual as possible. Ever since I produced our first Norfolk & Western locomotive prototype, I have periodically received inquiries or suggestions about the idea of producing coal hopper cars of equivalent quality. I am again receiving these inquiries as we head towards the production of the class 'A', so I throw the idea out for general comment. Hopper cars have not been the type of rolling stock that I have typically considered for production, but with sufficient demand, they certainly could be. If this idea is of interest to you, please let me know and provide some specific recommendations. These inquiries have come with the knowledge that appropriate types of hoppers have been produced, but seemingly detail and quality are the driving issues. We have all spent time in recent months discussing the subject of which shows or conventions are with our attention and that seems to be a growing issue these days. Without going into the possible reasons why most shows or conventions are failing to achieve success in terms of attendance numbers, I would like to pose a simple question; what would make a show worthy of your attention? Carrying the question a bit further, the vast majority of my model owners have never attended a train show of any type. If you are such an owner, what could possibly be included in a show or convention setting that would make your attendance a possibility? Please give this some serious thought and take the time to let me know. 1/05/14 - I have received several inquiries and comments about a subject related to my 12/11/13 update on the PRR N5 Project Update page and felt that in the interest of time conservation I would provide my comments regarding the matter here. I am aware that a well known dealer is offering for sale O scale brass trucks that look like a sample that I have had posted on my web site in one case and a rerun of a previously produced truck used on one of my projects in another. The facts are that they were produced by the same builder that tried to scam Kohs & Company on the PRR N5 cabin car project using my designs and tooling. Make no mistake, this is a business relationship formed as a result of the deceit of my former builder and the involved dealer's acceptance of such business practices having been previously informed of the situation with the builder. Anyone interested will need to make their own decision about supporting this type of business practice with purchases. For many years Korean builders in general have been berated as a result of the actions of a very few. I have routinely defended Korean builders as a group when they have come under attack for issues of quality or accuracy, pointing out that regardless of the issue, if there is fault to be found with a model it is ultimately the importer that is responsible for accepting and/or delivering an inferior product to customers. In the case of an importer/seller knowingly encouraging an unethical builder, the question has to be asked who do you blame for the continued existence of such builders and the potential impact on the hobby? This situation will have no affect on my plans to offer a series of individual trucks for sale, they are already in the works with the new builder that is also producing the PRR cabin cars and flat cars. Updates on those projects will follow shortly on their respective project sites. 1/01/14 - A Happy New Year to all, may it be a year of less uncertainty and more prosperity for all! 2013 was marked by getting our projects back on track, pun intended, while planning for the future with an even greater passion for what our team hopes to accomplish. For those that are unfamiliar with the team that I refer to, it is made up of the researchers, suppliers and builders that I rely on to bring the ideas and concepts that we discuss to life. The 'requests' that I make of them are not easily handled by even the best in their respective fields and financial payment alone is not nearly enough to get the job done. It's the dedication to the mutual effort to be the best that is the fuel for our efforts, often times ignoring the frequent lack of financial sense. The past year has generated the highest level of interest in our work experienced to date with nearly 300,000 visitors to the more than 1,700 pages included in this web site. While many say that the interest in model railroading is dying, the Kohs & Company web site routinely ranks in the top 0.5% of all active web sites in the world. 2014 will see the completion of our Challenger model deliveries, the completion of our PRR cabin cars and flat cars as well as an accelerated level of effort to move our new projects along at a more desirable pace. A special thank you goes out to our loyal supporters for your incredible patiences as well as your interest in and support of our newest projects. I am hoping for an even greater level of communication in the new year and will be exploring some new ideas related to making that a reality. As always, I look forward to hearing from many of your regarding your ideas and suggestions.